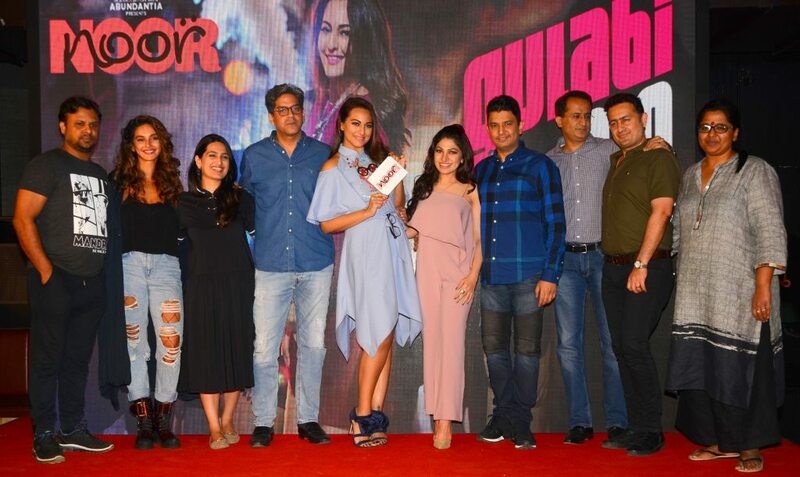 Even as the trailer of Sonakshi Sinha’s upcoming film ‘Noor’ continues to get accolades and ‘Uff Yeh Noor’ is climbing the charts, producers Bhushan Kumar and Vikram Malhotra launched the film’s latest track ‘Gulabi 2.0’ on Wednesday evening. Present at the launch was Noor aka Sonakshi Sinha, along with the producers Bhushan Kumar and Vikram Malhotra, singers Tulsi Kumar, Yash Narvekar, composer and singer Amaal Mallik, lyricist Kumaar, actors Shibani Dandekar, Kanan Gill and director Sunhil Sippy. The song titled ‘Gulabi 2.0’ is a re-created version of the highly acclaimed hit by veteran composer RD Burman. The original was sung by legendary singer Mohammed Rafi. The song has been given a modernized touch of Electronic Dance Music, retaining the retro magic of the original. The groovy and peppy track has been composed by music director Amaal Mallik, who has also lent his voice to the song with singers Tulsi Kumar & Yash Narvekar, lyrics penned by Kumaar, and choreographed by Adil Shaikh. “Noor”, set in the city of Mumbai, has Sonakshi playing a journalist, with big dreams and aspirations. It’s the story of a girl who isn’t different from any of us, but wants to make a difference. The film captures Noor’s journey… Her relationships, career, aspirations, friendships, choices… Her infatuations, her insecurities, like her issues with her physical appearance, and her many dilemmas as she comes of age, and develops a fresh perspective on life. “Noor”, directed by Sunhil Sippy, presented by T-Series in association with Abundantia Entertainment and Produced by Bhushan Kumar & Vikram Malhotra, releases on April 21st, 2017.